Visions of Jesus Christ.com - Caterina Bartolotta, Hemography. 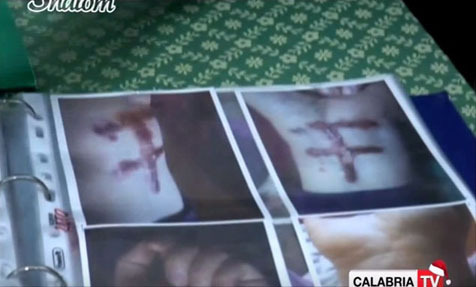 Above images from [this] video are Catherine Bartolotta's hemography/blood writings. Translation from Italian. Catherine Bartolotta is a Calabrian mystic who sees the Madonna from the age of about 10 years. Every year, during Holy Week, the manifest the stigmata. 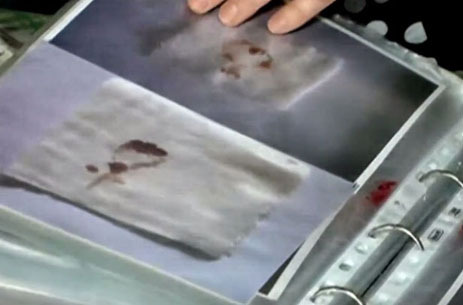 Gauze and handkerchiefs are resting on Stigmata leaving the marks of hemography/blood writings. Following excerpt from [here]. Catherine is a Catholic mystic, born in 1963 in Settingiano, a small village in Calabria, Italy. After a miraculous recovery, at the age of nearly 10 years, July 12, 1973, begins to see the Madonna, which entrusts the mission to serve the Lord through their own physical and mental suffering, which will be used to save many souls. One year after the beginning of the apparitions, Catherine Receiving the Stigmata, which continue to occur each year, up to the present day. Even today, after about 42 years, the apparitions continue, with conversions, physical and spiritual healing. Catherine is the wife and mother of 4 children, her mission continues among many sufferings, but she is always ready to sacrifice for others, to welcome every person who knocks on his door to try Madonna. The many diseases they never stop, she continues to serve Christ and the Virgin Mary offering herself for the love of God and neighbor. Every Monday Our Lady appears to bring a message of peace, of love, but above all conversion. Every month hundreds of people go to find Catherine to pray with her ​​and ask Our Lady the Mother of God the graces of their hearts. Catherine Bartolotta was born in Settingiano, Catanzaro small town of about 3200 inhabitants, a few km. from Catanzaro, October 21, 1963, from Joseph, then a janitor at a middle school, and Vittoria Virgillo, housewife. The house where she was born, still parental home, is located in Via C. Canale Franco n. 10 and is a modest house built on two levels and in adherence to the neighboring houses, according to the time construction criteria. Over the years, the family grows with the arrival of Francis in 1966, Annamaria in 1972 and Maria Luisa in 1979. The Catherine earthly life begins, then, in a small town and in a small Calabrian family without wealth economic, with parents who in his spare time is devoted to the cultivation of the earth. Since the early years of age, Catherine manifests a sweet and affable character. These qualities of character and especially his willingness to help others, make it more desired and loved by all. Within the family, Catherine grows up with a sound education, with the moral principles that make the home environment calm and peaceful, devoid of hypocrisy and always ready to sacrifice for the common good. The small Caterina has a peculiarity: his speech is genuine and sincere, and his tone of voice, at times, takes on a sweetness that seems to come, rather than from his mouth, straight from his soul and his heart, giving the feeling the hearers to have in front of a pure mind. Nothing portends, however, what will happen next. Suddenly, at the age of about nine years, Catherine is struck by seizures, of which we do not know the origin and do not manage to understand the root cause, therefore, the parents will decide on admission at the ' Catanzaro hospital and later at the S. Camillo di Roma, where it is discharged with a diagnosis of epilepsy uncertain than ever. The ordinatole care does not have any effect on her and, after returning Settle, crises recur stronger than before. "I realized immediately that it was the Madonna because he was wearing a white robe embroidered with golden roses, yellow stars on a blue robe, a crown with twelve stars, four Angels, two red roses on the feet that rested a network of 31 roses flaming red, and it was all lit up with a bright light. " Our Lady, in that same appearance, talks to Catherine saying these words: "I am the Lady of Purification, and I have come to grant you the grace, you maiden, August 2 the upcoming month will heal, to 14.45 you will have the last crisis that will last about a minute; I want a witness to assist the midwife of the country ". On August 2, 1973, as he had predicted the Madonna, in the presence of family members and the midwife of Settingiano Maria Ranieri, Catherine, at exactly 14.45 starts to feel bad. Parents, not yet convinced of the authenticity of the apparitions, they feared for his health. Seeing her writhing in the throes of that terrible crisis despaired. Suddenly, the crisis ceases, Caterina changes physiognomy, his body returns to normal, relaxed, and not stiff, his face becomes radiant and glowing. The parents look at each other, almost in disbelief that strange transformation. After Catherine crisis remained tired, downcast, weak. Instead, that time everything was different after that crisis appeared more beautiful than before. That will go down in history as the last seizure of Catherine. As the days passed, the parents began to realize that crises were really missing and that something extraordinary was really happening to their child, in their home: Catherine had actually seen her. [See/view] to read full story with more like - A prediction: the death of his grandfather, The miraculous healing of Sister Caterina, The spiritual director Catherine: Don Giovanni Capellupo, Mary entrusts a mission to Catherine, A promise, A great sign of the Lord: the stigmata. Videos [here].